This entry was posted in Uncategorized on May 31, 2017 by Gary. Not only will the bear market in the dollar drive a new bull market in gold, it will also drive the bubble phase in stocks which will continue until a parabolic structure forms and then collapses. After that the inflation will move into the commodity markets. This entry was posted in Uncategorized on May 28, 2017 by Gary. I’ll tell you when it’s time to buy miners and it’s not time yet. We need to generate some excessive bearish sentiment first. That will come only at the intermediate cycle bottom. And that’s not due until June. This entry was posted in Uncategorized on May 26, 2017 by Gary. I predict it’s going to be a boring summer for stocks. Price will just churn sideways for the next 2-3 months and allow the long term averages time to “catch up”. This entry was posted in Uncategorized on May 23, 2017 by Gary. 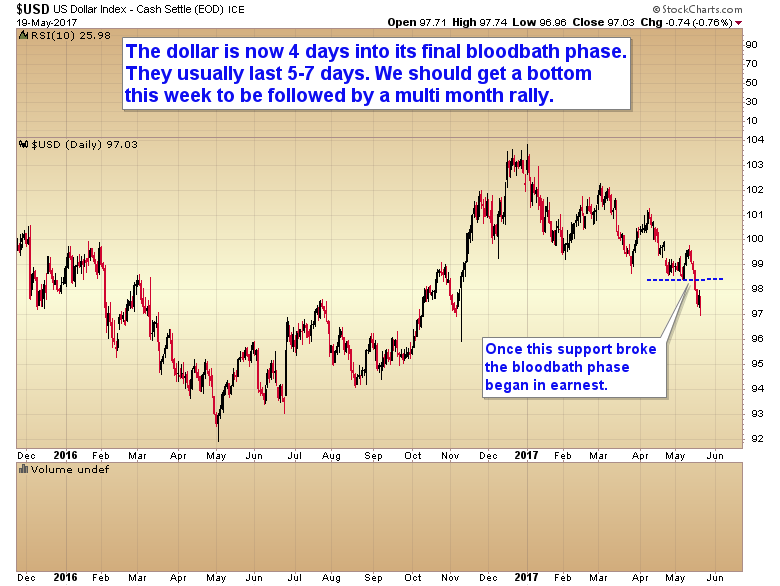 The dollar is now 4 days into its final bloodbath phase. This phase usually lasts 5-7 days. We should get a bottom this week. This entry was posted in Uncategorized on May 21, 2017 by Gary. The stock market has not been allowed to correct naturally in recent weeks. As a result, bullish sentiment was not cleansed and we have not been able to generate a sustained breakout. What this has done is compress the selling into a very short time frame. This entry was posted in Uncategorized on May 17, 2017 by Gary. I’m leaving soon for my summer climbing trip. During this time I’m not going to have a lot of time to keep up with the blog so I’ll mostly just concentrate on the nightly reports for subscribers. I’ll be back in August and things will return to normal. Gold has tagged that $1245 zone I noted and the dollar reached the 50% retracement. the 5 day RSI has reached overbought. This is a potential spot for the cycle to top. So plan accordingly. 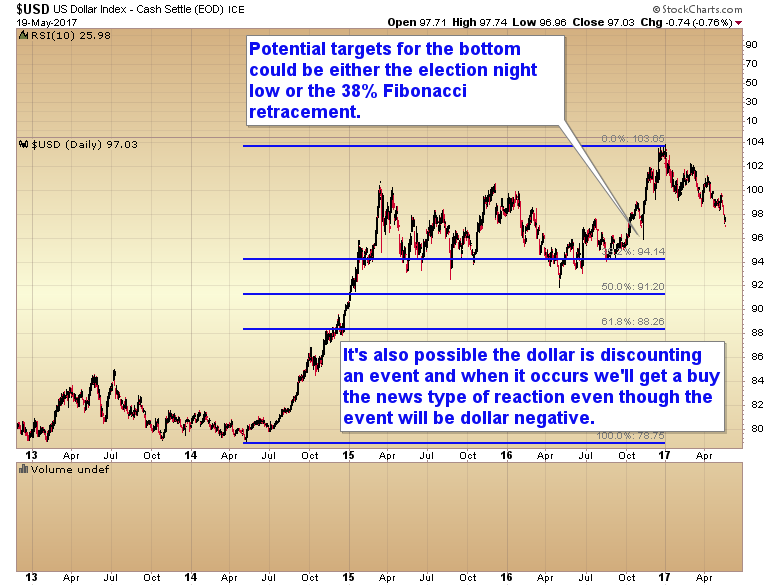 The dollar has finally broken below its intermediate cycle trend. Last year the yearly cycle low occurred in early May. The most recent daily cycles have been running 35 – 40 days. The current daily cycle is on day 35. This entry was posted in Uncategorized on May 16, 2017 by Gary. This entry was posted in Uncategorized on May 15, 2017 by Gary. 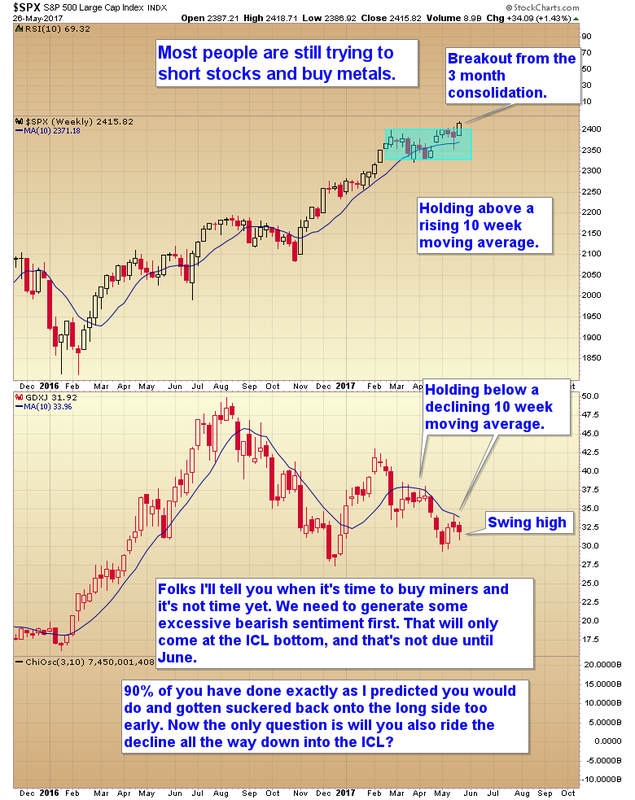 The next big trending move will occur in the energy markets. 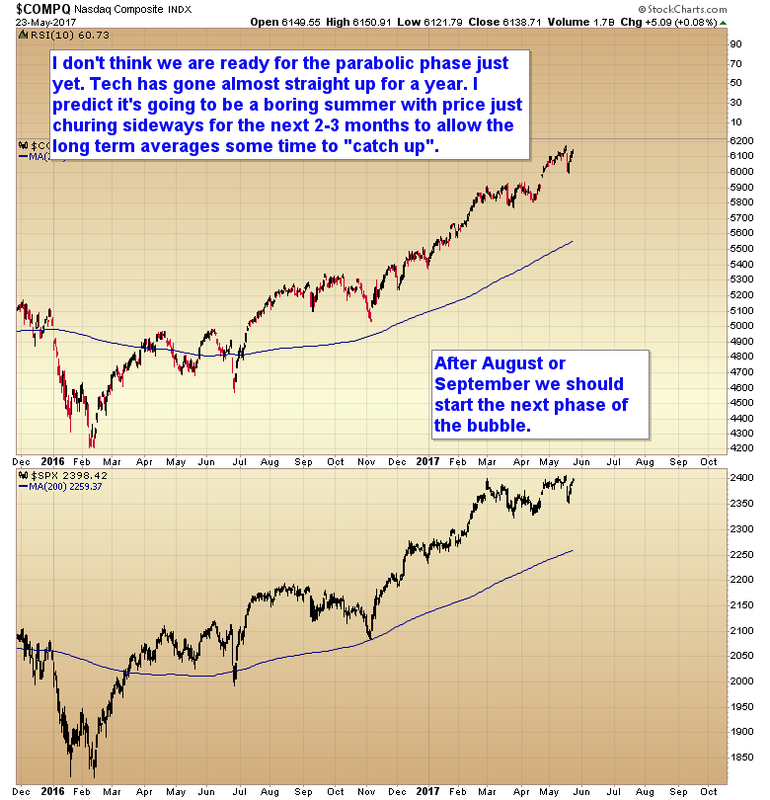 All the technical and cyclical signs are in place to suggest a major bottom is forming. In the precious metals market we have the exact opposite setup. This video will clarify how these two markets are likely to behave in the next several months. This entry was posted in Uncategorized on May 14, 2017 by Gary.